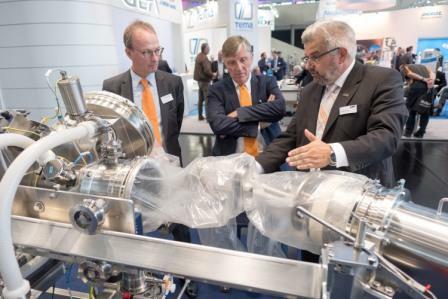 The 20th edition of POWTECH, which took place 26-28 September in Nuremberg, brought together 835 exhibitors from 29 countries in its six halls at the modern exhibition complex of the event’s owner and organiser NürnbergMesse GmbH. Once again it confirmed its position as the world’s foremost trade fair for powder, bulk solids and particle technologies, with 39% of the exhibitors coming from outside Germany. During the course of the three days the event attracted over 14,000 visitors from a wide spectrum of industries. These ranged from the food, pharmaceutical and chemical sectors, through to construction, ceramics and recycling.